2.In large skillet, heat oil over medium-high heat. Add garlic and shallot; cook 1 to 2 minutes, stirring frequently. Add shrimp; cook 1 to 2 minutes, turning once halfway through cooking. Stir in zest, salt and pepper; add wine and lemon juice; cook 1 minute or until internal temperature of shrimp reaches 145°F. 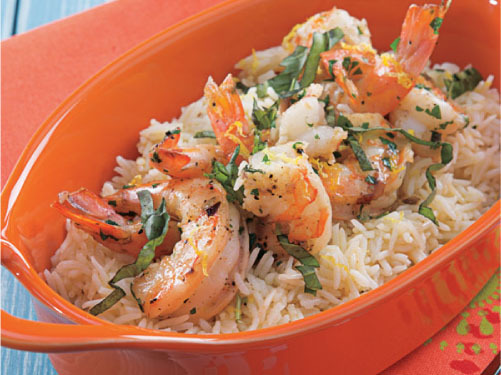 Stir in butter until melted; sprinkle basil and parsley over shrimp and sauce. Serve shrimp mixture over rice.